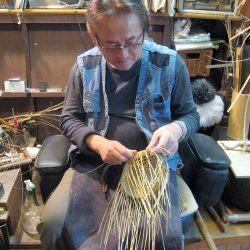 Unaffiliated with any of Japan’s craft arts organizations, Nagakura is the first recipient of the Cotsen Bamboo Prize, awarded in 2000, and an esteemed independent artist for more than 20 years. His organic, contemporary pieces are rooted in the functional baskets made for centuries for flower arranging at Japanese tea ceremonies but also borrow from wide-ranging sources, including European sculpture, the American pop art movement, indigenous Japanese forms, and cord-patterned clay work from the 3rd and 2nd millennia B.C. His fine plaiting mimics complex line drawing and the graceful shapes of his vessels are inspired by human form and by objects from the natural world, such as fallen leaves, emerging shoots, and cocoons. Nagakura began his career dyeing fabric for kimonos but quickly realized he wanted to make artwork, like ceramics, that had an inherent vitality. He spent three years splitting bamboo for his grandfather, who was a bamboo craftsman. Several years later, he brought his work to a contemporary gallery that gave him a solo show. He is passionate about jazz, classical, and rock music, and strives to elicit the “rhythm and harmony” of bamboo. Nagakura’s work is in the collection of the Ruth and Sherman Lee Institute for Japanese Art. For me, bamboo is what pigment is for a painter or stone is for a sculptor. Discovering their true medium is a profound pleasure for an artist. When the sensitivities of both artist and the material are in sync, the medium becomes the voice, flesh, and heart of the artist. Working with bamboo, I become both author and audience. The resulting creation stands between two worlds – visible and invisible. I hope that it resonates with an eternal spirit and stirs the soul. My relationship with bamboo will continue throughout my life. For me, inspiration comes from the workings of nature, both large and small, near and distant. My desire is to share with other human beings the silent voice of nature.